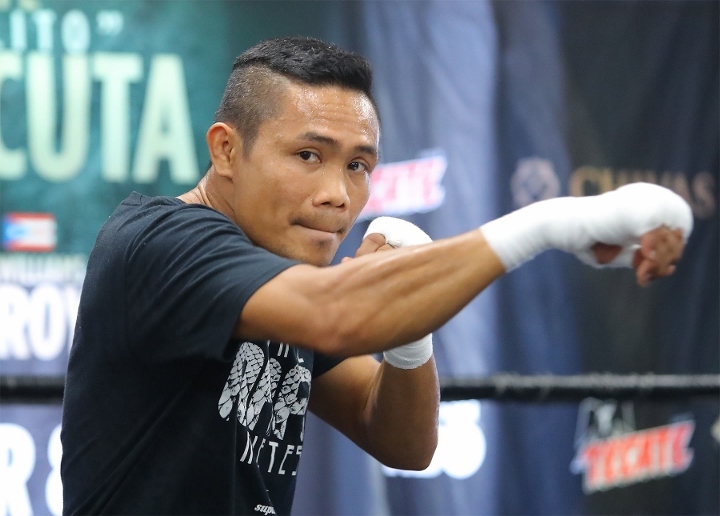 Wynn Palace Cotai, Macao – For the vacant World Boxing Organization super flyweight world title, Donnie Nietes (42-1, 23 KOs) won a tough twelve round split decision over Kazuto Ioka (23-2, 13 KOs). The scores were 118-110 for Nietes, 116-112 for Ioka, and 116-112 for Nietes. With the win, Nietes becomes a four division world champion – and the victory blocked Ioka from becoming the first four division world champion from Japan. Ioka retired in April 2017 as the WBA flyweight champion. He resumed his career back in September, by making his American debut with a solid ten round decision win over McWilliams Arroyo to capture the WBC silver super flyweight title at The Forum in Inglewood, California. Coming in, Ioka built up a nine fight win streak since losing a close twelve round split decision to Amnat Ruenroeng in 2014. Nietes saw action on same September card at The Forum, when he fought to a controversial twelve round split draw with Aston Palicte for the vacant WBO title – in a fight where almost everyone felt Nietes had done enough to win. Nietes has been riding an undefeated streak since 2004. Ioka was working behind a very solid jab in the early rounds, but it was Nietes who was landing some very solid punches to get the crowd excited. In the third, they were both finding success with hard shots landing. More of the same in the fourth, with Nietes getting off with big counters to the head. Ioka was targeting heavy to the body and connecting with some decent head shots as well. Ioka was still working hard behind his jab in the fifth and pressing forward. Nietes was using the jab to get in close to land quick shots or combinations. In the sixth, they were trading punches and jabs at close range. Nietes seemed to have the edge when it came to landing upstairs. The eight was very close, with Ioka landing the best shots of the round. Ioka was pushing Nietes back with the jab in the ninth. The defense of both was on display, with many punches being partially blocked. They were trading heavy leather in the closing seconds. Both were picking their shots with more care in the ninth. Ioka had made adjustments with using a lot more movement in the tenth, giving Nietes some issues when it came to landing punches of note. The eleventh was another round where both had their moments. Nietes closed the round stronger with his flashier punches, but Ioka rallied really hard in the closing seconds. The twelfth and final round saw seesaw action. Both boxers were doing their best to let it all hang out. Nietes once again was landing the flashier punches, with Ioka targeting the body in close and using his jab as the main weapon.